New Premium options now mean that for 3 € a month, you get almost anything you could want. 9 € unlimited. Image courtesy SoundCloud. We hear some pretty clear messages from CDM readers about SoundCloud. One, almost all of you seem to have some criticisms of it. Furthermore, even artists who do use something like Bandcamp tend to use SoundCloud, too, if my inbox is any indication; Bandcamp is ideal for formal releases, but SoundCloud has unique, embeddable players and the ability to release live performances and podcasts and things that aren’t EPs or LPs. Since Bandcamp is for most of us more about discrete album release, that puts the two in very different niches. The big news for creators here: it’s now easy to recommend premium service, as they’re much cheaper and simpler. It’s cheap enough, in fact, that having been comped by the nice folks at SoundCloud, I wound up just pulling out my credit card and buying it for myself. The Unlimited service, which had gone for a whopping 59 € a month, now costs just 9 € a month, with extended uploads and stats. If you just want uploads, the 3 € a month plan is sufficient, with most of what the 9 € a month plan offered before. Now: 3 € a month gets you unlimited downloads, all the extras, 4 hours of uploads. 9 € a month gets you unlimited uploads. 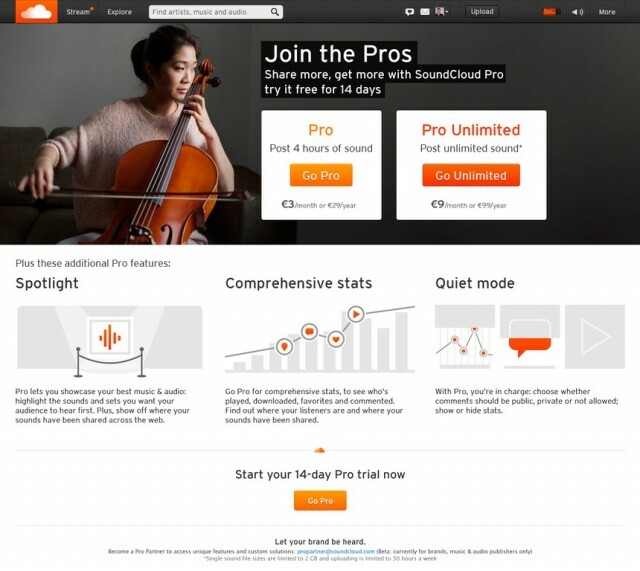 At 3 € a month, in fact, I wouldn’t hesitate to recommend SoundCloud to any musician, producer, or podcaster. Is it a perfect service? No. Do I still like using it? Yeah, actually. But let’s get to some of those complaints. To me, they illustrate both the challenges the service faces, and the extent to which artists and labels are using the service. Vintage SoundCloud plans – confusing, expensive. Now, even the top tier features seen here cost only 9 € a month. The full functionality, with 4 hours of uploads instead of unlimited, is 3 € monthly. Even at reduced prices, I do expect gripes about SoundCloud to continue. Two changes in the service appear to have triggered user frustration from the creator community. First, the redesign, while unquestionably more attractive, changed the location of some features and made fine-grained management of feeds and sets more difficult for some users, depending on how they use the service. (It is worth reading SoundCloud’s help article on where features went, but I know that doesn’t address all the complaints.) For the casual user, this may not be apparent, but CDM readers who manage labels and surf a greater stream of audio content have seemed more annoyed. The redesign also attracted complaints about features designed to increase “discovery,” by placing other users’ tracks alongside your own. These should increase plays overall, but don’t appeal to some users who value control. Secondly, some users have become victims of automatic algorithms designed to ferret out illegal music uploads. SoundCloud, like any company operating on the Web, is liable for infringement in any country in which it operates. Web startups have taken various approaches to that – and some have flirted more with the law than others. But SoundCloud, now the largest service of its kind, has opted to employ machine listening systems designed to fingerprint audio files and match them with protected works. Some (not all) mixes have therefore been disabled. More surprisingly, I’ve recently started getting angry reports from readers who had music they themselves owned blocked. The lesson for SoundCloud should be clear: if you can’t stop false positives, you’d better make it very, very easy for users to appeal the process. Seeing your own music blocked from upload is not a happy experience. Not revolutionary, by any means, but partners can now show off slide shows with sounds for a visual element. SoundCloud may be taking steps toward pricier sponsors, but this feature might be one other users see in the future, too. What these tensions illustrate to me, though, is that SoundCloud has to walk some very thin lines. They want to encourage active uploads, but stay within the law. They want to stay in legal compliance, but not anger legitimate users. They want to appeal to a growing user base (becoming a YouTube of sound), but maintain core, advanced users (labels and creators built SoundCloud, and remain a big part of the service’s draw). Then there’s another problem: they need to make money. Another component of the March announcement is a set of features for a beta “Pro Partner” program. That program is closed, for now, open to only those SoundCloud chooses – right now, a somewhat oddball combination that includes a fancy coffee shop, the Grammies, and Red Bull, among others. (The variety, presumably, is intended to show some range for would-be future advertisers.) As with Twitter, that appears to suggest sponsored promotion of specific “Who to Follow” choices. An animated image slide show also more prominently features brands, though SoundCloud tells CDM that some of those features could be offered to us everyday, non-partner users in the future. GigaOm, while taking a jab at the mixed success of European startups in general, wrote that the changes could suggest real profit potential. For the creator community, I think the main issue is that SoundCloud continue to demonstrate value. If it can attract a passionate user community paying a few euros a month, it could be better for all of us – that’ll mean that we, the creators, remain its main revenue source. Flickr Pro’s success in the photography community, before a few years of absent management from parent Yahoo, is instructive. When I first wrote about SoundCloud at its release, I suggested it could be a “Flickr of sound” rather than a “YouTube of sound.” That, uh, does reveal just how long SoundCloud has been around – but building a successful Web business around pros still seems viable to me. Some of the challenge seems to be not that SoundCloud is willfully ignoring pro requests, so much as like many Web services, changes are hard to accomplish. 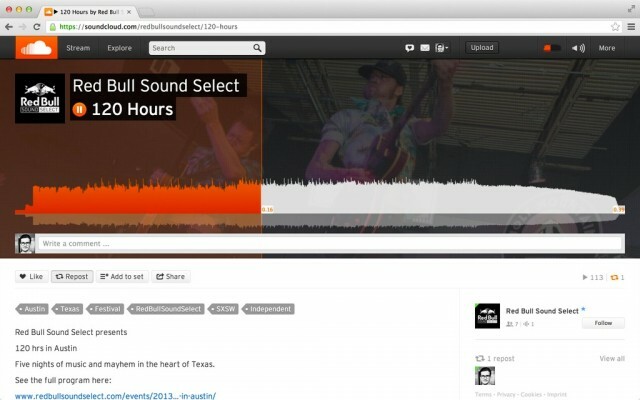 In addition to making the service cheaper, though, SoundCloud continues to make improvements. As The Verge reported last week, an mobile update adds set management features, as well as refreshing the look of the iOS app. That app looks a lot better to me; it might at last mean I use the mobile app and not only the browser version. I am, of course, heavily biased, as a creator using the service myself on a site called “Create Digital Music.” But I do think that SoundCloud’s future will depend on its ability to continue to please its core audience of producers and labels. They are more passionate about sound than anyone else. Their needs can therefore inform the needs of those using the service more casually and for spoken word, they can help attract those brand partners, and they’re more likely to generate subscription revenue. My own analysis, having watched the service evolve from the beginning, is that they’re the foundation of the company’s more recent, explosive growth. For now, I’m sticking with the service, though. Of course, I also keep local copies of those sounds, and share through my own site first, SoundCloud URL second. Even if someone asks me for a SoundCloud in a bar. Let us know specifically what features you feel are working or need improvement, and whether you’re sticking with SoundCloud or have found other ways of sharing your sounds that you prefer.